Noboru Baba (1927–2001) was born in Aomori Prefecture. In 1949 he moved to Tokyo to begin a career as a manga artist, soon making a name for himself drawing manga for young boys. 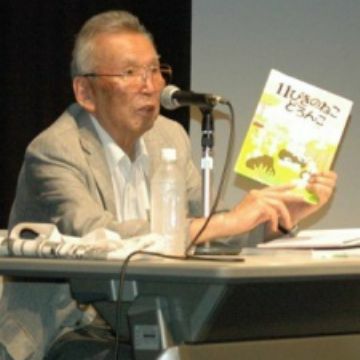 His debut as a picture-book illustrator came in 1964, when he won a Sankei Children’s Book Award for Kitsune-mori no yamaotoko (Mountain Man of Fox Wood). He received another Sankei Children’s Book Award in 1968 for Eleven Hungry Cats (tr. 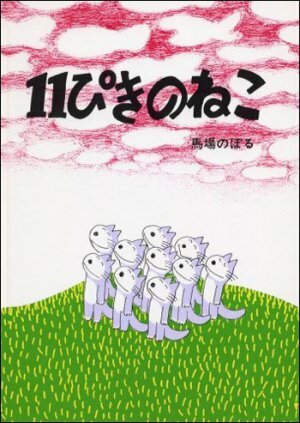 1988), and the Bungeishunjū Manga Award in 1973 for Eleven Cats and Albatrosses (tr. 1988). His foldout book in the same series, Jūippiki no neko marason taikai (Eleven Cats Run the Marathon), won a kids’-choice award at the Bologna Children’s Book Fair in 1985. Other titles include Kuma no Māsuke (Māsuke the Bear), Māsuke no bōshi (Māsuke’s Hat), Monta to inoshishi (Monta and the Boar), and Tarafuku Manma (Belly Full).